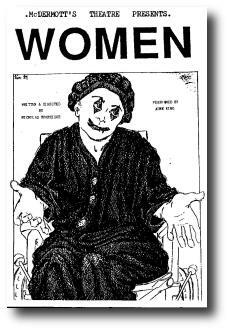 'If the BBC were to ask Berkoff to present "Jackanory", "Women" might have been the end result. Immensely visual language characterised each play in this four-part presentation. The versatility of the performer Aine King was evident in her ability to portray with equal credibility such diverse characters. However, her Mad Hatter-esque antics in "Darkness and Sail", as a manic maid rushing round a dinner table, impersonating each of her employers in turn seated at a table, most amply demonstrated such an ability.